"Shelley Shepard Gray writes with honesty, tenderness, and depth. Her characters are admirable, richly-layered and impossible to forget." 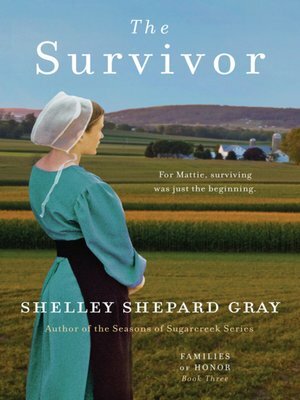 One of today's most beloved authors of inspirational Christian fiction, Shelley Shepard Gray completes her acclaimed Families of Honor series with The Survivor—a poignant and beautiful story of love and faith in a small Amish community. Delving once more into the lives of these devout and fascinating folk, as she did in her popular Sisters of the Heart and Seasons of Sugarcreek novels, Gray tells the story of a young Amish woman who has survived the ravages of cancer, but now longs for the love of the one man who can heal her lonely heart. Like Beverly Lewis, Wanda Brunstetter, and Cindy Woodsmall, Shelley Shepard Gray introduces readers to characters they will never forget as she masterfully depicts a world of simple living, abiding faith, and honest emotions.